Prices • Quilt Preparation • Quilting Examples • Email Me! I have now quilted over 520 quilts. Once again my work has been featured on the web extra in McCalls as well as in the May 2010 edition of McCall's Quick Quilts. I have worked with many different techniques with different battings, backings, quilts that were already begun and some that had unique qualities. Each quilt has been custom quilted with my own designs in consultation with the client. I am constantly developing new designs and after having recently attended a longarm conference I am filled with new ideas. There are new pictures of many of these in the photo gallery area. It is so amazing to see the piecing and applique skills the different quilters have. I have been making quilts since 1997 and love working with fabric, colours, designs and thread. 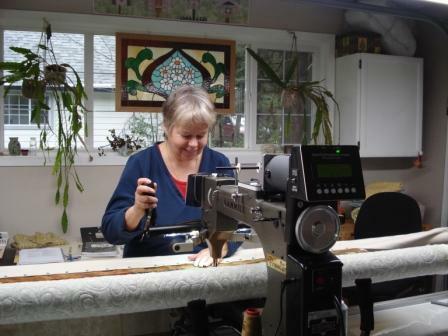 My Gammill longarm quilting machine is an amazing tool that allows me to soar in all sorts of new and exciting directions. It allows me the freedom of freehand and custom design to complete even the largest quilts. Together, we can work to choose the perfect quilting that best compliments the piecing of each top. Be assured that your finished quilt will be unique and one you can be proud of. Many of us find a lot of enjoyment in the piecing part of a project but when it comes to sandwiching the quilt we start to lose interest or realize we don’t have the space to complete the task. When we do manage to get the layers together, the job of just wielding those layers into our sewing machine can seem overwhelming. My little Janome and I have been through this journey a hundred times. It is hard work...hard on the machine and harder on the shoulders and wrists. Often, by the time we have decided on the quilting design the task seems so daunting we move onto other projects and that top is abandoned. I am offering original designs and all-over freehand patterns. When we choose a pattern we will evaluate the complexity of the piecing, overall feel of the quilt and its intended use. Some quilts need simplicity in design, others need the quilting to be an integral part of the piece. It is helpful for me to get a sense of what you have in mind so you are happy with the results. Your finished top will be ready to become an instant heirloom....and you can show off your fabric arts skills for all to see!I am conscious of the fact that in these economic times it is important to keep prices reasonable. Please check out the preparation and prices pages on the website to see what you can do to keep prices lower. Preparation by you will help and really takes little time! The turnaround time for quilting is now 5 - 8 weeks from the time I receive the quilt.